Summer is the perfect season to get outside and spend some time in your garden. There is nothing quite like enjoying your morning coffee, afternoon tea, or a night cap while staring out at a beautifully landscaped yard. Even if you don’t have the greenest of thumbs, there are easy things you can do to take your backyard from zero to hero. Here are a few simple summer landscaping ideas for your home. Placing some decorative patio areas or walkways are a great way to add depth and style to your yard. This can also lay the blueprint for further landscaping. Professional pavers with knowledge and expertise can be difficult to find. Speak to your local landscaping professionals to brainstorm some great concrete and path ideas. Adding some charming flower boxes onto a windowsill or off of a deck banister is a quick and inexpensive idea to brighten your Fort Worth home for summer. There are some species of flowers that will fair better than others in a window box. Make sure to look at the amount of sun the area gets before choosing your flowers or plants. If you have patio furniture with fabric padding, then you know that it only takes a few seasons for that cloth material to start to fade. Replacing the covers on your padding can be a quick face lift for your patio. A well maintained yard always looks great. However, getting out in the Fort Worth heat does not always sound like a fun thing to do. 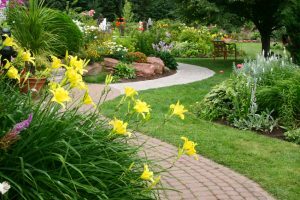 If your summer is looking to be a busy one, hire a professional landscaping company to do the maintenance for you. If you have any questions about summer landscaping, call Blooms Landcare at (817) 688-5352 to schedule an appointment. We would be happy to assist you with all your landscaping needs.